Body lice are small, usually pale- to grey-colored insects that live and reproduce in clothing worn by humans. Body lice feed on human blood and can survive only on people. The oblong eggs (called “nits”) are usually tan- or brown-colored but can appear whitish under bright lights. They are about 1 to 2 mm long. The nits hatch after about 1 week then pass through 3 stages (over 1 to 2 weeks) before becoming full-sized adults that are about 2 to 3 mm long. The reactions to or results of louse feedings may be the first symptoms noted. Bites can cause itching at the feeding sites. Scratching may break the skin and lead to skin infections. 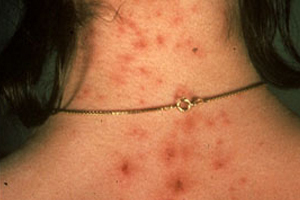 Feeding sites may look like small, red dots on the skin. 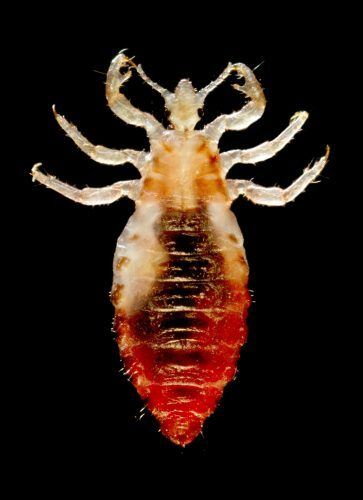 Body lice are known to transmit bacterial infections that cause three human diseases: louse-borne typhus (Rickettsia prowazeki), trench fever (Rochalimaea quintana), and louse-borne relapsing fever (Borrellia recurrentis). Body lice are spread through direct person-to-person contact with someone who has body lice. It can also be spread through contact of clothing, beds, bed linens, or towels that have been in contact with someone who has body lice. There is no laboratory test to confirm body lice. Body lice can be diagnosed by finding eggs and crawling lice in the seams of clothes. 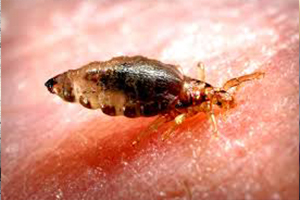 Sometimes a body louse can be seen crawling on skin during feeding. Wash clothing, bedding, and towels using hot water and dry with high heat. Improve personal hygiene for the infested person. Medicated lotions can be used on the body as well. There is no immunity to body lice. There are no statistics on how many people have been infected with body lice in Hawaii. In the United States, body lice infestations are only found in homeless or transient populations who do not have access to regular bathing or clean clothes. Reduce the risk of catching body lice by bathing regularly, changing and washing clothes, and avoiding potentially infested bedding.